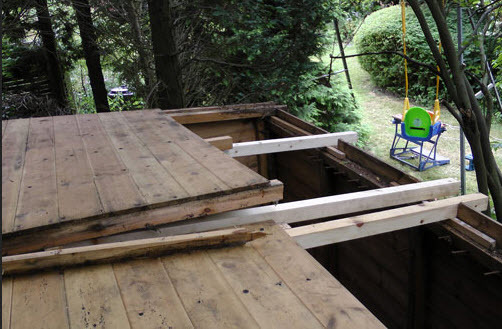 Repairing A Shed Roof - Don't worry its not a difficult as it sounds! We live in a consumer society, when something breaks the standard solution many times is to throw it away and buy a replacement. And I have to admit that these were my thoughts when I first saw the pictures that Duncan McIntyre sent through of the damage caused to his shed roof by a long term leak. 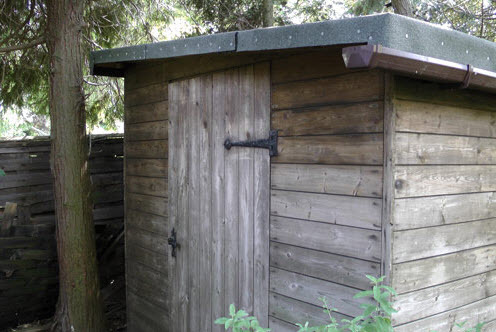 The shed had done well lasting 15 years, with its original roofing felt intact. But in the spring of this year damage due to the leak in the roofing felt became apparent. Water from the leak had caused a good proportion of the roof boards to rot and all of the supporting rafters. 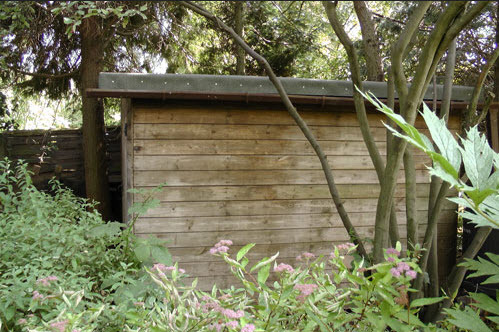 The shed is located in a very sheltered section of Duncans garden where it is covered by trees. 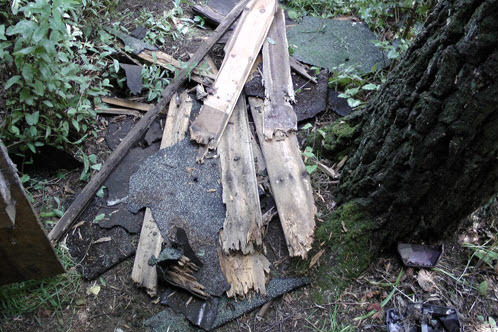 This sheltering effect had most probably contributed to the long life of the shed roofing felt (which normally only lasts 5-7 years) but the proximity of one tree in particular was the cause of the damage to the shed. 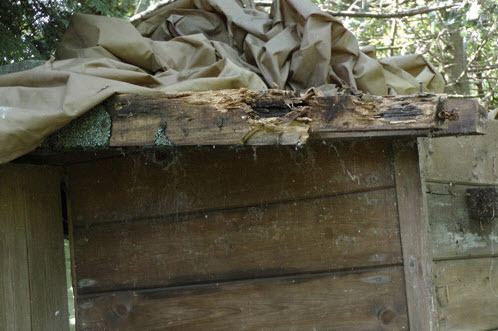 With repair of the roof, rather than replacing the whole shed as Duncans preferred option, the first step was to determine the extent of the damage. Removing the single layer of mineral roofing felt, soon showed how much of the roof really needed replacing. It became apparent that about half of the pine boards forming the roof deck were damaged beyond repair. 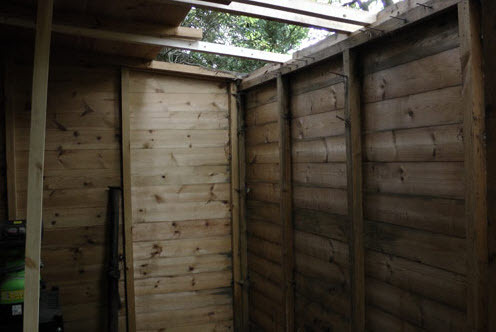 Also the rafters that spanned the full width of the mono-pitch shed were rotten at the lower end. It is worth pointing out that water of itself does not cause timber to lose strength. It is only when timber is wet for extended periods and its moisture content rises above 20% that the conditions for fungal growth of wet rot. The wet rot consumes the cells in the wood and the timber beam becomes weak and friable. It is also worth remembering that as the timber dries out and the moisture content of the timber falls below 20% that the fungus becomes inactive. So when repairing structures such as this the important thing is to cut out the weak and friable timber but that just a small bit of water staining does not mean that the timber has to be repaired or replaced. Deciding how much timber to remove and which bits could be replaced was at the core of this project. Aside from the rotten roof boards the main structural damage was to the rafters. 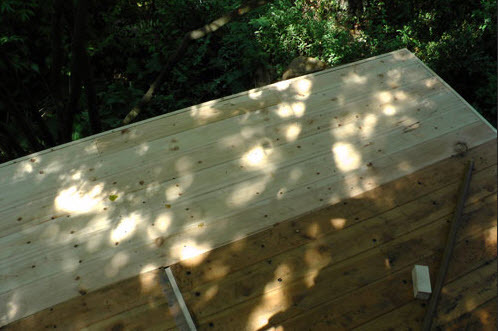 The end of each rafter was unusable and so the decision as to whether to splice a length of timber on to the remaining good timber or replace the whole rafter was considered. In the end, as the rafters were of a fairly small cross section, a whole new rafter was bolted alongside the damaged rafter. With the new primary support for the roof in place the roof boards were then fixed in position and then covered with the roofing felt. The final touches were to replace the shed guttering system. So that the shed now is back to a very serviceable condition. 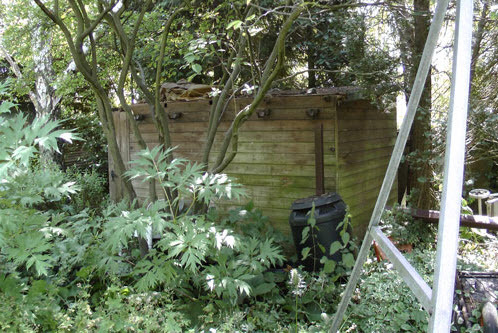 Replacing the shed roof has given this shed many more years of service. The new roof has every chance of lasting as long as the original and Duncans inspection of the rest of the timber forming the shed showed that all of the remaining timbers, including the foundations are in a good condition. 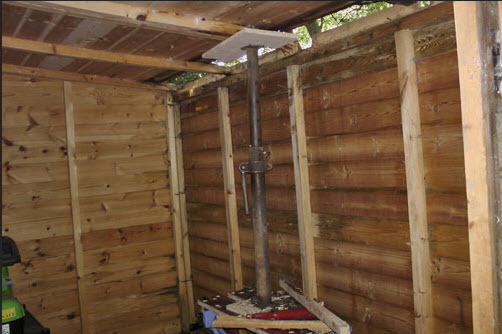 Replacing the whole shed with one of an equivalent size and quality would have cost well over £500 and involved a fair amount of work to dismantle and dispose of the existing building. Then there would have been the transport to site and erection of the new structure. Not an inconsiderable project in itself. The cost to Duncan for the materials involved in the repair were less than £75 and the time taken for removing the damaged wood, fitting the new deck and timber was around 3 days. Overall then it was a definite win for Duncan and a lose for the consumer society. The amount of time required to repair as shed roof is on a par with building a new one and the cost of materials less than 1/10th. This cost saving is a big plus for any one with basic DIY skills and in a similar situation. Also when purchasing a new shed it is worth considering the repair factor 15 years down the line. 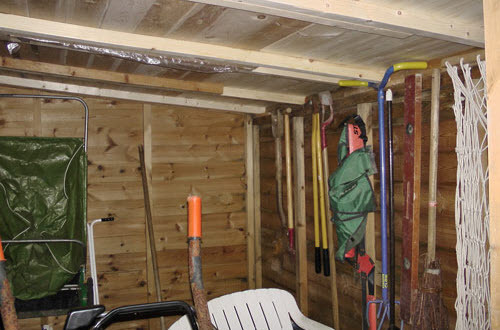 Repairing a timber shed such as this is so much easier than for a similar sized shed made of plastic or metal. On the repairability front timber sheds win hands down. Had you considered using EPDM as an economic and long lasting alternative to shed roof felt?